Ammonia transporters (TC# 1.A.11) are structurally related membrane transport proteins called Amt proteins (ammonia transporters) in bacteria and plants, methylammonium/ammonium permeases (MEPs) in yeast, or Rhesus (Rh) proteins in chordates. In humans, the RhAG, RhBG, and RhCG Rhesus proteins constitute solute carrier family 42 whilst RhD and RhCE form the Rh blood group system. 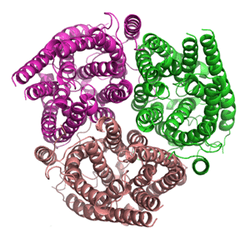 The three-dimensional structure of the ammonia transport protein AmtB from Escherichia coli has been determined by x-ray crystallography revealing a hydrophobic ammonia channel. The human RhCG ammonia transporter was found to have a similar ammonia-conducting channel structure. It was proposed that the erythrocyte Rh complex is a heterotrimer of RhAG, RhD, and RhCE subunits in which RhD and RhCE might play roles in anchoring the ammonia-conducting RhAG subunit to the cytoskeleton. Based on reconstitution experiments, purified RhCG subunits alone can function to transport ammonia. RhCG is required for normal acid excretion by the mouse kidney and epididymis. The structure of the ammonia channel from E. coli, was, at the time of its publication, the highest resolution structure of any integral membrane protein. It shows a trimer of subunits, each made up of 11 transmembrane segments (TMSs) and containing a pseudo two-fold symmetry. Each monomer contains a hydrophobic ammonia conducting channel. While prokaryotic ammonia channel proteins have an N-terminal region which acts as a signal sequence and is cleaved in the mature protein, the Rhesus glycoproteins retain this as a 12th transmembrane helix in the mature protein. Most functionally characterized members of the family are ammonium uptake transporters. Some, but not other Amt proteins also transport methylammonium. Detailed phylogenetic analyses of plant homologues have been published. In E. coli, NH4+, rather than NH3, may be the substrate of AmtB, but controversy still exists. If NH4+ is transported, K+ possibly serves as a counter ion in an antiport process with K+, and that one histidine removes a proton off of NH4+ to yield NH3. The X-ray structures have revealed that the pore of the Amt and Rh proteins is characterized by a hydrophobic portion about 12 Å long, in which electronic density was observed in the crystallographic study of AmtB from Escherichia coli. This electronic density was initially only observed when crystals were grown in the presence of ammonium, and was thus attributed to ammonia molecules. The Amt/Rh protein mechanism might involve the single-file diffusion of NH3 molecules. However, the pore could also be filled with water molecules. The possible presence of water molecules in the pore lumen calls for a reassessment of the notion that Amt/Rh proteins work as plain NH3 channels. Indeed, functional experiments on plant ammonium transporters and Rh proteins suggest a variety of permeation mechanisms including the passive diffusion of NH3, the antiport of NH4+/H+, the transport of NH4+, or the cotransport of NH3/H+. Lamoureux et al. discuss these mechanisms in light of functional and simulation studies on the AmtB transporter. In E. coli the AmtB gene is expressed only under limiting nitrogen levels to yield the AmtB protein. It is co-expressed with the GlnK gene which encodes a PII protein. This protein is also trimeric and remains in the cytoplasm. It is covalently modified by a U/U deuridylylated group at Y51. The hydrolyzed product, adenosine 5'-diphosphate, orients the surface of GlnK for AmtB blockade. When nitrogen levels outside the cell rise, the ammonia channel must be deactivated to prevent excessive ammonia entering the cell (where ammonia would be combined with glutamate to make glutamine, utilizing ATP and thereby depleting the cell's ATP reserves). This deactivation is achieved by deuridylylation of the GlnK protein which then binds to the cytoplasmic face of AmtB and inserts a loop into the ammonia conducting pore. At the tip of this loop is an arginine residue which sterically blocks the channel. 1 2 3 Gruswitz, F.; Chaudhary, S.; Ho, J. D.; Schlessinger, A.; Pezeshki, B.; Ho, C. -M.; Sali, A.; Westhoff, C. M.; Stroud, R. M. (2010). "Function of human Rh based on structure of RhCG at 2.1 A". Proceedings of the National Academy of Sciences. 107 (21): 9638–9643. doi:10.1073/pnas.1003587107. PMC 2906887 . PMID 20457942. ↑ Nakhoul NL, Hamm LL (Feb 2004). "Non-erythroid Rh glycoproteins: a putative new family of mammalian ammonium transporters". Pflügers Archiv. 447 (5): 807–12. doi:10.1007/s00424-003-1142-8. PMID 12920597. 1 2 1xqe; Khademi S, O'Connell J, Remis J, Robles-Colmenares Y, Miercke LJ, Stroud RM (Sep 2004). "Mechanism of ammonia transport by Amt/MEP/Rh: structure of AmtB at 1.35 A". Science. 305 (5690): 1587–94. doi:10.1126/science.1101952. PMID 15361618. 1 2 2u7c; Zheng L, Kostrewa D, Bernèche S, Winkler FK, Li XD (Dec 2004). "The mechanism of ammonia transport based on the crystal structure of AmtB of Escherichia coli". Proceedings of the National Academy of Sciences of the United States of America. 101 (49): 17090–5. doi:10.1073/pnas.0406475101. PMC 535379 . PMID 15563598. ↑ Khademi S, Stroud RM (Dec 2006). "The Amt/MEP/Rh family: structure of AmtB and the mechanism of ammonia gas conduction". Physiology. 21 (6): 419–29. doi:10.1152/physiol.00051.2005. PMID 17119155. ↑ Mouro-Chanteloup I, Cochet S, Chami M, Genetet S, Zidi-Yahiaoui N, Engel A, Colin Y, Bertrand O, Ripoche P (2010). Fatouros D, ed. "Functional reconstitution into liposomes of purified human RhCG ammonia channel". PLOS ONE. 5 (1): e8921. doi:10.1371/journal.pone.0008921. PMC 2812482 . PMID 20126667. ↑ Wagner CA, Devuyst O, Belge H, Bourgeois S, Houillier P (Jan 2011). "The rhesus protein RhCG: a new perspective in ammonium transport and distal urinary acidification". Kidney International. 79 (2): 154–61. doi:10.1038/ki.2010.386. PMID 20927037. ↑ Biver S, Belge H, Bourgeois S, Van Vooren P, Nowik M, Scohy S, Houillier P, Szpirer J, Szpirer C, Wagner CA, Devuyst O, Marini AM (Nov 2008). "A role for Rhesus factor Rhcg in renal ammonium excretion and male fertility". Nature. 456 (7220): 339–43. doi:10.1038/nature07518. PMID 19020613. ↑ Conroy MJ, Jamieson SJ, Blakey D, Kaufmann T, Engel A, Fotiadis D, Merrick M, Bullough PA (Dec 2004). "Electron and atomic force microscopy of the trimeric ammonium transporter AmtB". EMBO Reports. 5 (12): 1153–8. doi:10.1038/sj.embor.7400296. PMC 1299191 . PMID 15568015. ↑ Thornton J, Blakey D, Scanlon E, Merrick M (May 2006). "The ammonia channel protein AmtB from Escherichia coli is a polytopic membrane protein with a cleavable signal peptide". FEMS Microbiology Letters. 258 (1): 114–20. doi:10.1111/j.1574-6968.2006.00202.x. PMID 16630265. ↑ Soupene, Eric; King, Natalie; Feild, Eithne; Liu, Phillip; Niyogi, Krishna K.; Huang, Cheng-Han; Kustu, Sydney (2002-05-28). "Rhesus expression in a green alga is regulated by CO(2)". Proceedings of the National Academy of Sciences of the United States of America. 99 (11): 7769–7773. doi:10.1073/pnas.112225599. ISSN 0027-8424. PMC 124347 . PMID 12032358. ↑ Musa-Aziz, Raif; Chen, Li-Ming; Pelletier, Marc F.; Boron, Walter F. (2009-03-31). "Relative CO2/NH3 selectivities of AQP1, AQP4, AQP5, AmtB, and RhAG". Proceedings of the National Academy of Sciences of the United States of America. 106 (13): 5406–5411. doi:10.1073/pnas.0813231106. ISSN 1091-6490. PMC 2664022 . PMID 19273840. ↑ Andrade, Susana L. A.; Einsle, Oliver (2007-12-01). "The Amt/Mep/Rh family of ammonium transport proteins". Molecular Membrane Biology. 24 (5-6): 357–365. doi:10.1080/09687680701388423. ISSN 0968-7688. PMID 17710640. ↑ von Wittgenstein, Neil J. J. B.; Le, Cuong H.; Hawkins, Barbara J.; Ehlting, Jürgen (2014-01-01). "Evolutionary classification of ammonium, nitrate, and peptide transporters in land plants". BMC evolutionary biology. 14: 11. doi:10.1186/1471-2148-14-11. ISSN 1471-2148. PMC 3922906 . PMID 24438197. 1 2 Fong, Rebecca N.; Kim, Kwang-Seo; Yoshihara, Corinne; Inwood, William B.; Kustu, Sydney (2007-11-20). "The W148L substitution in the Escherichia coli ammonium channel AmtB increases flux and indicates that the substrate is an ion". Proceedings of the National Academy of Sciences of the United States of America. 104 (47): 18706–18711. doi:10.1073/pnas.0709267104. ISSN 1091-6490. PMC 2141841 . PMID 17998534. ↑ Ishikita, Hiroshi; Knapp, Ernst-Walter (2007-02-07). "Protonation states of ammonia/ammonium in the hydrophobic pore of ammonia transporter protein AmtB". Journal of the American Chemical Society. 129 (5): 1210–1215. doi:10.1021/ja066208n. ISSN 0002-7863. PMID 17263403. ↑ Javelle, Arnaud; Lupo, Domenico; Zheng, Lei; Li, Xiao-Dan; Winkler, Fritz K.; Merrick, Mike (2006-12-22). "An unusual twin-his arrangement in the pore of ammonia channels is essential for substrate conductance". The Journal of Biological Chemistry. 281 (51): 39492–39498. doi:10.1074/jbc.M608325200. ISSN 0021-9258. PMID 17040913. ↑ Lamoureux, G.; Javelle, A.; Baday, S.; Wang, S.; Bernèche, S. (2010-09-01). "Transport mechanisms in the ammonium transporter family". Transfusion Clinique Et Biologique: Journal De La Société Française De Transfusion Sanguine. 17 (3): 168–175. doi:10.1016/j.tracli.2010.06.004. ISSN 1953-8022. PMID 20674437. ↑ Durand A, Merrick M (Oct 2006). "In vitro analysis of the Escherichia coli AmtB-GlnK complex reveals a stoichiometric interaction and sensitivity to ATP and 2-oxoglutarate". The Journal of Biological Chemistry. 281 (40): 29558–67. doi:10.1074/jbc.M602477200. PMID 16864585. ↑ 2nuu; Conroy MJ, Durand A, Lupo D, Li XD, Bullough PA, Winkler FK, Merrick M (Jan 2007). "The crystal structure of the Escherichia coli AmtB-GlnK complex reveals how GlnK regulates the ammonia channel". Proceedings of the National Academy of Sciences of the United States of America. 104 (4): 1213–8. doi:10.1073/pnas.0610348104. PMC 1783118 . PMID 17220269. As of this edit, this article uses content from "1.A.11 The Ammonium Channel Transporter (Amt) Family", which is licensed in a way that permits reuse under the Creative Commons Attribution-ShareAlike 3.0 Unported License, but not under the GFDL. All relevant terms must be followed.